Develop A Digital Savings Culture With Consumer Microfinance Bank's "EsusuOnline"
You can exit the unemployment situation ravaging Nigeria by becoming an agent for ESUSUONLINE - "MUTUAL FINANCE SCHEME" of #ConsumerMicrofinanceBank Limited. 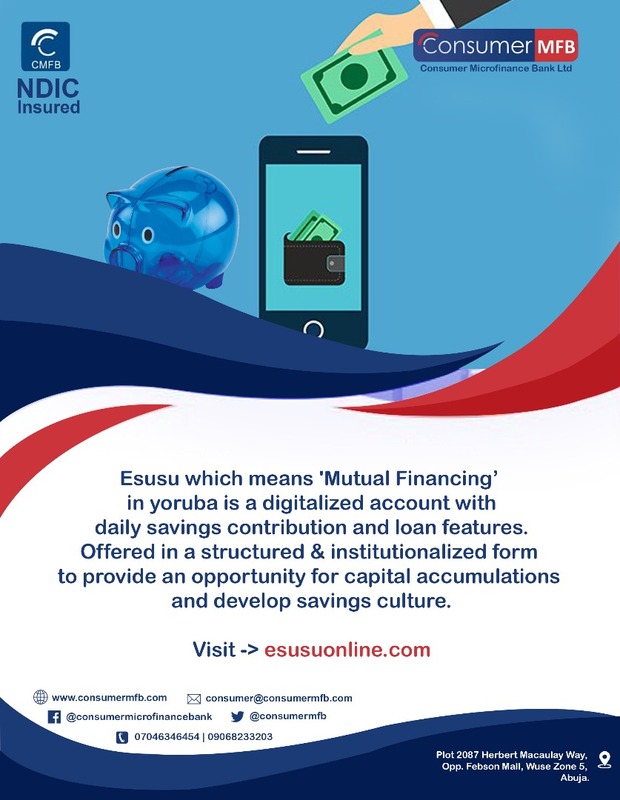 Esusu which means ‘Mutual Financing’ in Yoruba is a digitalized account with a daily savings contribution and Loan features. Offered in a structured & institutionalized form to provide an opportunity for capital accumulations and develop savings culture. 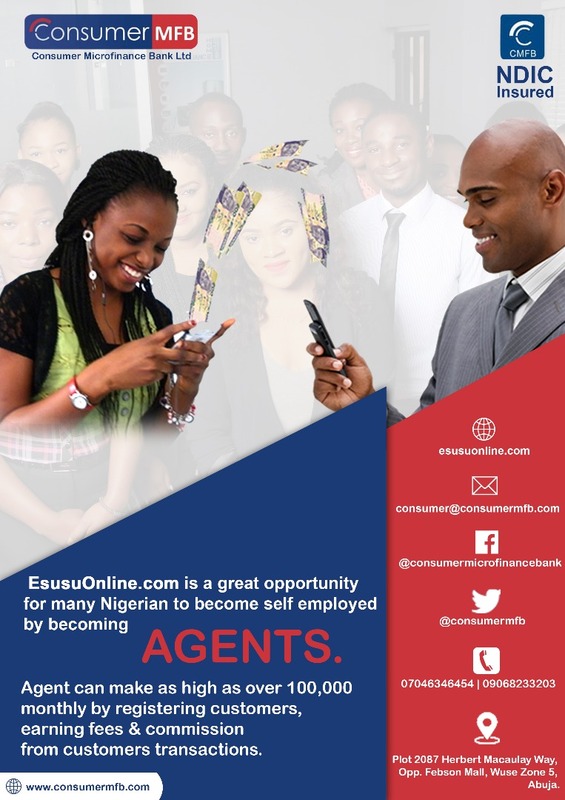 EsusuOnline.com is a great opportunity for many Nigerians to become self-employed as AGENT and make a minimum of 100,000 Naira monthly by registering customers, earning fees & commission from customers’ transactions. 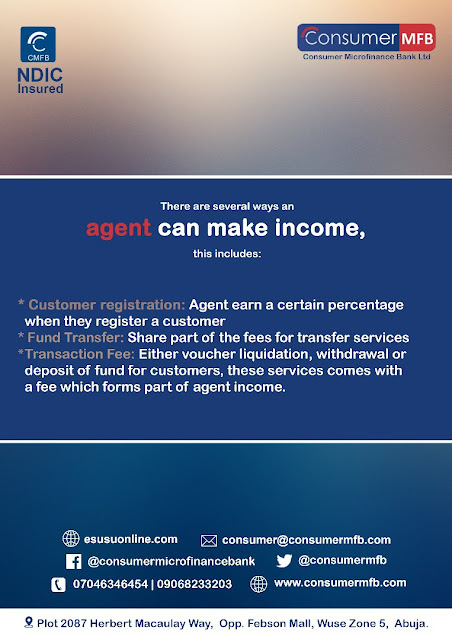 Microfinance Bank Limited for Low income savers to not only save their little change but also access funding for their business and projects, is a unique dynamic "one of its kind" Savings/Funding scheme online. It is that easy and fast. 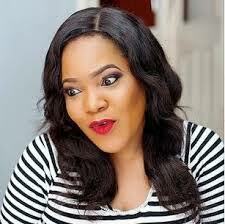 Start making money as a registered user or agent by registering family and friends.